Fabrício Júnior has been a 3D student for almost 2 years. His craft focuses on character production. Mr. Júnior attended the Estúdio VivaArte and AtelierCg to hone his craft and has had the wonderful experience of being given jobs in 3D printing. Already 27 years of age, Mr. Junior believes that his commission work has contributed widely to his evolution as an artist. And while he does not have any current affiliation, Mr. Júnior needs no affirmation from peers about his work. All he needed were good and reliable mentors to help him every step of the way. Now, he simply does what he believes develops his capabilities further and his works always turn out good. Let’s get to know Mr. Junior in this short feature and see how much he had developed through perseverance and mentorship. 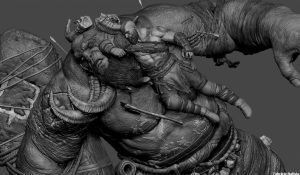 Fabrício Júnior (FJ): Although I currently perform almost the entire production process in ZBrush, my first experiences were using Maya where I learned a little about polygonal modeling. This made it easier to use some tools like Zmodeler. Since I started using ZBrush my focus always was in the artistic part, which I always considered the most difficult to obtain. I am currently looking to evolve the two parts, technical and artistic. 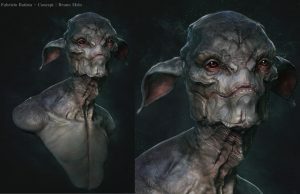 XC: What are specific ZBrush features do you employ in the production of your art? Has it helped you in improving your art better? FJ: I use conventional brushes most of the time during the sculpt step. I use Zmodeler a lot for Hardsurface and other more precise things. 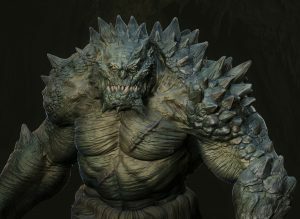 But the strong point of ZBrush is the artistic freedom it provides. I use conventional brushes most of the time during the sculpting phase. I use Zmodeler a lot for Hardsurface and other more precise things. But the strong point of Zbrush is the artistic freedom it provides. FJ: It was a passion. I always believed that working with 3D was something very distant, to the point of thinking that people started very young to reach adulthood ready to work in the area. It was when I met the Artist André Castro with whom I had private lessons and the teachers from EstudioVivaArte, Alex Oliver and Gabriel Paula, who accompanied a good part of my evolution. These people were essential in my beginning. 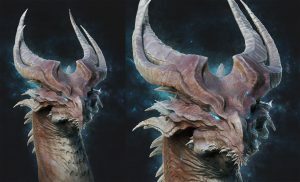 XC: What do you think is your edge as a 3D artist? FJ: I believe my advantage is that I really like the challenge of doing something. Even if it is time consuming, I love the process and I seek to constantly improve it. FJ: My greatest influences are Rafael Grassetti, Igor Catto, Gilberto Magno and many others. I have other influences as important as, that are my closest teachers like Alex Oliver, Gabriel Paula, André Castro, Ricardo Luiz Mariano and Rafael Souza. FJ: The challenges are many, but I think the most important thing is that the level of work required is always high, but I do not think that is a bad thing. FJ: No doubt it’s God Of War-Spartan Fury, I took a lot of time and learned a lot in the process. FJ: Look for a teacher to help you choose the best paths, but do not place the responsibility of your evolution on anyone. 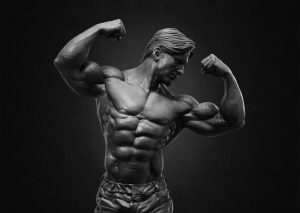 The person responsible for its development is just you, whether studying anatomy or anything else. It’s a commitment to evolve every day and your teacher is there to show you the best ways to do that. Want to see more of Mr. Fabrício Júnior’s works? Click here!